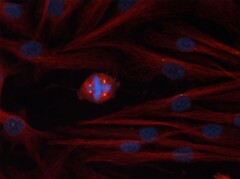 This image shows a human epithelial cell (DNA in blue) with increased numbers of centrosomes (green) amid a sea of normal cells in interphase. Centrosome amplification can lead to chromosomal instability and an abnormal number of chromosomes. These features are hallmarks of cancer and therefore potential targets for new therapies.